I think that is a very apt quote by the author of the Harry Potter fantasy series. If you don't at least try at something, what is the purpose of your life? 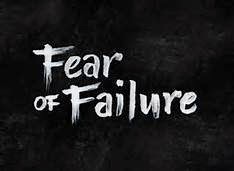 The fear of failure inhibits many people, including yours truly. There are things I wanted to try in life. But, I was so fearful of failure, I just gave up. So, my life has been a series of fear of failure. There are some people born to achieve and others who fear to achieve. I obviously fall in the latter category. But, I did publish a novel, something that I was fearful of doing. I can hang my hat on that one. Still others try and try again until they do succeed. There are many famous failures. One of the most obvious is Abraham Lincoln. In his youth, he went to war with the rank of Captain. He return with the rank of Private. He started numerous businesses, went bankrupt twice, and was defeated in 26 political campaigns. Obviously, the word "quit" was never a part of President Lincoln's character. Let's take a look at a few more famous failures in history. That quote above, by JK Rowling, is prophetic At one time she was penniless, suffered with bouts of depression, divorced and trying to raise a child all on her own. She did all this while attending school and writing a novel. JK Rowling went from welfare to become one of the richest women on earth. Walt Disney was once fired from his job at a newspaper because "...he lacked imagination and had no good ideas." To prove that his firing was justified, Disney went and started several other businesses that ultimately failed. He went bankrupt several times. However, Walt Disney did not give up. He came up with a cartoon character that clicked. It was none other than Mickey Mouse which paved the way for a vast entertainment empire known as Disney. Soichiro Honda suffered a series of failures and bad luck. He was turned down for a job with the Toyota Corporation as an engineer. He remained jobless for a long time. While unemployed, he started making scooters at home and sold them. This eventually blossomed into the giant Honda Corporation. Think Toyota regrets not hiring him now? Thomas Edison was told by his teachers he was too stupid to learn anything. Imagine how that made him feel. He was fired from two jobs for not being productive enough. He tried 1000 times to invent the first light bulb. He had an assistant tell him he should just quit, give up. Thomas Edison replied, "I have not failed once. I have just tried 1000 things that don't work." Stephen King. That name invokes the macabre of writing like no other. His first novel, Carrie, got 30 rejection notices. That's right, 30 rejection notices. King finally gave up and threw it in the trash. But, he had a wife who believed in him and took it out of the trash. She urged him to resubmit it one more time. The rest is history as he is now the author of hundreds of published books and having had some books turned into movies. “You ain’t goin’ nowhere, son. You ought to go back to drivin’ a truck.” Needless to say, Elvis didn't take that person's advice. He went on to become one of the great legends of music. When The Beatles were just starting out, Decca Recording Studios, which had recorded 15 of The Beatles songs, dropped them and told them they didn't like their sound. "Guitar music is on the way out. You have no future in this business." John, George, Paul and Ringo did not agree. These are just a few of the notables who failed at one time in life. Some failed constantly. But, they all had one thing in common, they refused to quit. Their single-mindedness toward a goal enabled them to become successful in their chosen careers.